. Objective: Librarians are the personification of librarianship. As such, evidence of effective library practice is embodied in librarians, in the lives they lead, and in the actions they take.This paper will explore how critical reflection informs meaningful and purposeful library practice through creating new forms of personal evidence.This personal evidence can then be incorporated into evidence-based decisions about individual library practice. Methods: This paper will report on two North American studies that the researcher has helped facilitate. The first used a critical reflective methodology called currere with a cohort of practicing academic librarians to examine their personal connections to librarianship. The second study focused on gathering autoethnographies from a group of North American academic librarians. The paper will compare how participant reflection experiences inform their library practice and align to the evidence cycle of Assess, Ask, Acquire Appraise, and Apply. Results: Participant experiences in these studies indicate that generating and critically examining forms of personal evidence can have profound effects on library practice and attitudes towards librarianship. 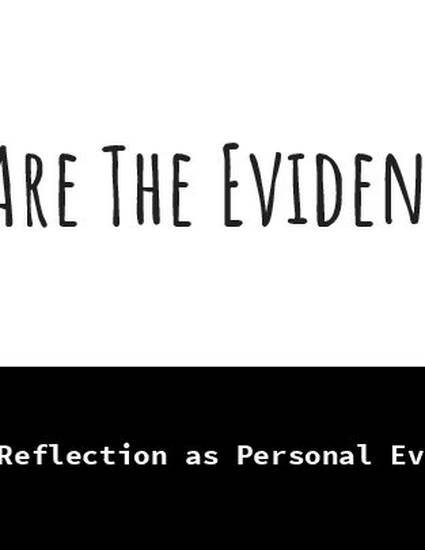 Conclusion: Reflection creates forms of personal evidence that can be incorporated into evidence-based decision making as to how each librarian chooses to embody librarianship.